Kerala is undoubtedly one of the most popular tourist destinations in India, and it has something to offer all year-round. 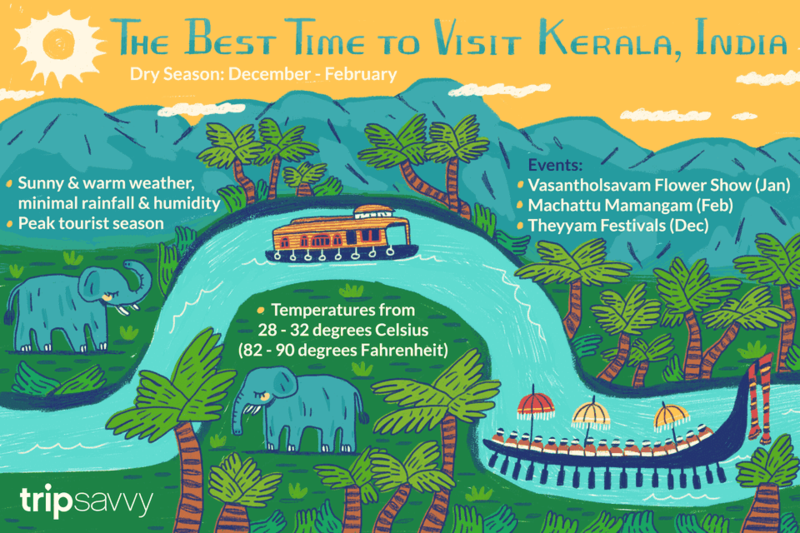 However, the best time to visit Kerala is the slightly cooler, dry season that runs from December through February. Not surprisingly, it's also the peak time to go. You should plan your visit according to what you want to experience (here are some suggested attractions and things to do in Kerala). It's really important to take the weather into account though, as the climate is a tropical one that receives rainfall from two monsoons. The dry season from December to February, which also marks peak tourist season. The hot, humid summer season from March to the end of May. Plan to sweat! Monsoon season (southwest and northeast monsoons) from the end of May to the end of November, which is punctuated by intermittent, heavy rain. Kerala is actually a very rainy state, which no doubt contributes to its lush greenery. Rain is commonly received during nine months of the year there. Temperatures typically range from 28 to 32 degrees Celsius (82 to 90 degrees Fahrenheit), although the highlands have been known to drop to around 20 degrees Celsius (68 degrees Fahrenheit). During summer, the very high humidity makes the heat feel much hotter though! Rain from the southwest monsoon sometimes causes flooding, of varying degrees, from June to August. It usually eases up near the end of August, and there's a break in the rain during September. However, the northeast monsoon arrives by October. It produces shorter but much more intense bursts of rain, until early December. If you're a nature enthusiast, Kerala has one of the few national parks in India that remains open during the monsoon season, Periyar National Park. Meanwhile, if you want to avoid the summer heat, the hill station of Munnar in Kerala is a refreshing option. Due to Kerala's location near the equator, there's very little variation in the length of days throughout the year. While the rainy, monsoon season can be a burden to visitors who wish to spend lots of time outdoors, it's actually the best time to receive Ayurvedic treatment in Kerala. This traditional natural healing system is the medical side of yoga and has been practiced for thousands of years in India. It's particularly widespread in Kerala, due to the the climate and abundant supply of medicinal plants there. The cool, moist, and dust-free atmosphere during the monsoon helps the body's pores to open up, making it most receptive to herbal oils and therapy. If you're looking to save money, Kerala is one of the best places in India to visit during the off-season from May to September. Most hotels and homestays provide substantial discounts of 20-50%, with very attractive offers to draw tourists at this time of year. Kerala Tourism has summer and monsoon packages listed on its website too, for the accommodations it manages. June to September: Snake boat races. August to September: Onam festival. The biggest festival of the year in Kerala, celebrations last for about two weeks. October to May: Theyyam. The districts of Kasaragod and Kannur, in northern Kerala, are known for their mysterious costumed spirit-possession theyyam rituals. A detailed calendar can be found here. January to May: Temple and elephant festivals. The festivals feature large processions of bejeweled elephants, drummers and other musicians, colorful floats carrying gods and goddesses, and fireworks. (Do note that although elephants are an integral part of worship in temples in Kerala, those who are concerned about elephant welfare may elect not to attend these festivals). January is winter in Kerala. The weather is sunny and warm with an average temperature of around 28 degrees Celsius or (82 degrees Fahrenheit) across most of the state, and minimal rainfall and humidity. It is peak tourist season through, so you can expect to pay a premium for most accommodations up until mid January. You'll also find the backwaters congested with houseboats. Some of the crowd can be avoided by traveling later in the month. Make sure you book well in advance. Kerala Tourism holds a state-wide Kerala Utsavam Folklore Festival during the first half of January. More than 200 folk art forms are showcased. Kerala Tourism's Vasantholsavam Flower Show at Kanakakkunnu Palace in Trivandrum is popular as well. The Swathi Sangeetholsavam Music Festival at Kuthiramalika Palace in Trivandrum, from January 4 to 13 every year, features classical Indian music. Adoor Gajamela at Sree Parthasarathy Temple in Adoor is the state's first temple festival of the year with elephants. Thaipooyam Mahotsavam at Sree Subrahmanya Swamy Temple in Alleppey district involves an unusual rapturous ritual dance. Week-long Ernakulathappan Uthsavom at the Shiva Temple in Ernakulum, near Kochi, is a cultural extravaganza. While it's still considered winter in Kerala, temperatures and humidity creep higher towards the end of the month, reaching up to 32 degrees Celsius (90 degrees Fahrenheit). However, the hills remain cool. It's an ideal time of year to visit Kerala, as there are less tourists compared to January but the weather is still comfortable. Head to the beaches in Kerala! Plus, there are many weird and wonderful traditional temple festivals happening. Kuttikkol Thampuratti Theyyam at Kuttikkol Thampuratty Bhagavathy temple, in Kasaragod district, is one of the state's grandest theyyam festivals. Machattu Mamangam has a colorful procession of huge horse effigies that are offered to the temple deity. It's held at Machattu Thiruvanikavu temple, in Kerala's Thrissur district. Highlights at Pariyanampetta Pooram, at Pariyanampetta Bhagavathy temple in Palakkad district, are folk arts and a procession of decorated elephants. Uthralikkavu Pooram at Sree Ruthira Mahakalikavu temple in Thrissur District, also has a procession of elephants. Held at Chettikulangara temple in Alleppey district, Chettikulangara Bharani features a procession of towering embellished cloth-covered structures. Men wearing masks engage in mock fights at night during Chittur Konganpada, at Chitturkavu Bhagavathy temple in Palakkad district. Seven large golden elephant statues are carried in procession during Ezhara Ponnana, at Ettumanoor Mahadeva temple in Kottayam district. The tourist season concludes in March. What most westerners would think of as spring is actually summer in Kerala. While the temperature doesn't increase much, the humidity is noticeably turned up in coastal areas. Evenings, after sunset, are cooler and more hospitable though. If you can deal with humidity okay, you'll be able to enjoy Kerala and its many temple festivals relatively tourist-free. Otherwise, you'll be constantly wiping yourself down with handkerchief by the end of March! Trivandrum goes up in smoke during Attukal Pongala, when the world's largest gathering of women for a religious activity cooks up a special offering for the goddess Attukalama. Chinakkathoor Pooram features fabulous folk art performances and elephant procession, at Chinakkathoor Bhagavathi temple in Palakkad district. Paripally Gajamela in Kollam district is one of the state's most impressive temple festivals, with up to 50 elephants present. Attuvela Mahotsavam is a water carnival. A procession of canoes carries colossal temple replicas to Elankavu Sree Bhagavathy temple, in Kottayam district. The rather alarming spectacle at Kodungalloor Bharani must be seen to be believed! Thousands of sword-wielding oracles in a trance swarm Kodungalloor Bhagavathy temple in Thrissur district. Local villagers make 70-80 foot tall structures that are carried in procession, lead by percussion instruments, at Malanada Kettukazcha. Cultural programs run throughout the night too. The venue is Poruvazhi Malanada temple, in Pathanamthitta district. The 10-day Painkuni Festival is celebrated by the royal family of Travencore at Sree Padmanabha Swamy Temple in Trivandrum. It features lofty fiberglass statues of the Pandavas brothers (from the Hindu epic The Mahabharata) placed outside the temple to please the Rain God, Indra. Thirunakkara Arattu is another of Kerala's famous temple festivals with elephants and folk dances. It happens at Thirunakkara Mahadeva temple in Kottayam district. High humidity makes April a very uncomfortable month in Kerala. If visiting the state then, it's recommended that you stick to mountainous areas. Head for the hills at Munnar or Wayanad. Nenmara Vallangi Vela at Nellikulangara Bhagavathy temple in Palakkad district offers some captivating performances of indigenous art forms and procession of elephants. Kadammanitta Patayani features a magnificent display of the ceremonial Padayani masked folk dance, to please the goddess at Kadammanitta Devi temple in Pathanamthitta district. May is an avoidable time to visit Kerala due to the brutal energy-sapping humidity and summer school holidays in India. Although it's hot, don't expect to be alone! Indians are used to the weather conditions and the state attracts plenty of vacationing families. The southwest monsoon arrives with a bang in Kerala in late May, providing much needed respite from the heat. If you want to chase the monsoon in India, Kovalam beach in Kerala is one of the first places to receive monsoon rain. You can watch the storm roll in there. Kerala's biggest temple and elephant festival, the Thrissur Pooram, usually takes place in May (or late April). The southwest monsoon season gathers intensity, making this a wet—albeit inexpensive—time to visit Kerala. Torrential downpours of rain occur throughout the month. For those who are willing to embrace the rain and humidity, there are enticing travel deals available. Be careful if you have health concerns such as sensitivity to mold though. Viral fever is also common at this time of year. Follow these tips to avoid getting sick during the monsoon season. The Champakkulam Boat Race, in Alleppey district, is the first snake boat race of the season. Ochira Kali is a mock fight that commemorates an historic battle. It's held in wetlands near Parabrahma temple in Ochira. Kottiyoor Utsavam takes place at two temples -- Akkare Kottiyoor and Ikkare Kottiyoor in dense forest in Kannur district. It runs for 28 days. Rituals on the first and last days attract the most spectators. July is also very wet in Kerala, as the monsoon continues. It brings the state's waterfalls to life though! You can still expect rainfall most days, particularly in the afternoons. It's usually moderate but is sometimes light, or heavy with thunderstorms. The ceremonial feeding of temple elephants during the Njangattiri Aanayoottu festival, at Njangattiri Bhagavathi temple in Palakkad district, is worth seeing. The southwest monsoon begins retreating in August. The volume of rain is less and there are a few more days without rain. Kerala's biggest snake boat race, the Nehru Trophy, is held on the second Saturday of August every year. (In 2018, it has been rescheduled to November 10 because of severe flooding in the state). The Uthradam Thirunal Pamba Boat Race, Payippad Boat Race and Aranmula Boat Race are also major snake boat races. They take place around the time of the Onam festival. Athachamayam marks the start of Onam celebrations. It happens at Thripunithura near Kochi and features a magnificent parade. The main day of Onam involves a lot of scrumptious feasting. Homes are adorned with bright floral arrangements. Kerala Tourism hosts an Onam Week cultural program in Trivandrum. Pulikkali is another part of the Onam festival. Men dress up as tigers with body paint and dance to the beat of drums through the streets in Thrissur. It's an entertaining spectacle. The end of the southwest monsoon results in many more dry days, particularly during the second half of the month. The weather is still hot and humid but bearable. Most low-season discounts are valid until the end of September. It's a good time to visit Kerala, as the backwaters are clean and the landscape is invigorated. Go hiking and spend time in nature. 28th Onam Kala Kettu Festival is a unique harvest thanksgiving festival that involves gigantic idols of bulls, made out of straw and cloth by locals, being pulled on wheels to Parabrahma temple in Ochira. Neelamperoor Padayani, at Palli Bhagavathi temple in Alleppey district, features a rare display of ritual Padayani folk dance. It also has a parade of giant effigies of mythical characters. The northeast monsoon brings another lot of rain in October, with less frequent but more copious downpours. The tourist season gets underway in October and there's a corresponding rise in prices. Navarathri Sangeetholsavam is a nine-day classical music festival that's held at the Fort Palace Complex in Trivandrum during Navaratri. The Panachikkadu Festival is also part of Navaratri celebrations in Kerala. A sacred "initiation into education" ceremony is performed for kids at Panachikkadu Saraswati temple in Kottayam district. If you don't mind a few tropical thunderstorms, Kerala is quite pleasant in November. There are more dry days than rainy ones. The Diwali festival isn't widely celebrated in Kerala. However, due to Diwali school holidays there's an influx of tourists from other parts of the country. Mannarasala Ayilyam, a snake festival at Mannarasala Sree Nagaraja temple in Alleppey district, is sure to leave an impression. The temple's snake statues are brought out in procession. The temple deities at famed Sree Padmanabhaswamy temple in Trivandrum are carried to the sea and given a bath during the Alpasi Festival. A grand procession is led by the head of the Travancore royal family. Massive chariots take to the streets around Sree Viswanatha Swamy temple at the Kalpathi Ratholsavam festival in Palakkad district. December is predominantly dry and sunny, with a slight drop in temperature and decreasing humidity as the climate transitions into winter. Peak tourist season starts in mid December and prices jump accordingly. The 10-day Perumthitta Tharavad Kottamkuzhy is the first major theyyam festival of the season, with a wide variety of performances. Kanathoor Nalvar Bhoothasthanam, at the end of December, is another important theyyam festival with about 400 different performances. The colorful Cochin Carnival is a fun festival held during the last week of December. Christmas is celebrated with enthusiasm across Kerala, as the state has a large Christian population. The Kochi-Muzhiris Biennale is the biggest exhibition and contemporary arts festival in Asia. It takes place every second year in and around Kochi, commencing in December and concluding in March.